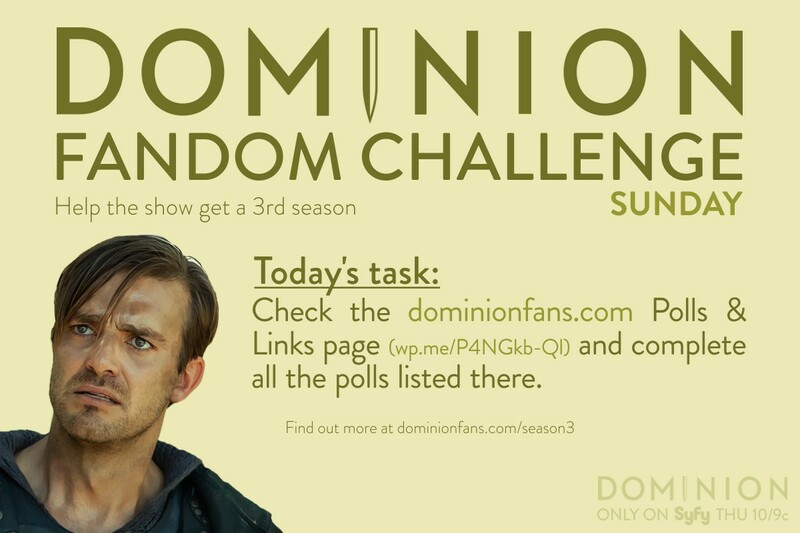 Is Dominion one of your favorite current shows? If so, it’d be great if you could go and nominate it as such over on SpoilerTV where they’re currently looking for people to submit their nominees for favorite current and favorite finished shows. You need to nominate two current shows (i.e. shows that are either currently airing or that have been renewed) and two finished shows (i.e. shows that have been cancelled or have ended). You can only submit once per person. If you submit more often than that, your nominations will be void. 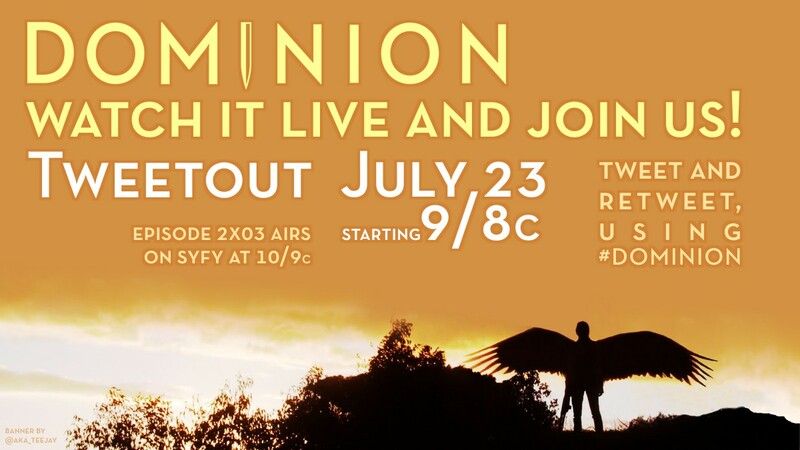 Join us over at @Dominion_Talk on Twitter! Feel like discussing Dominion plots, storylines and the show’s mythology on Twitter? 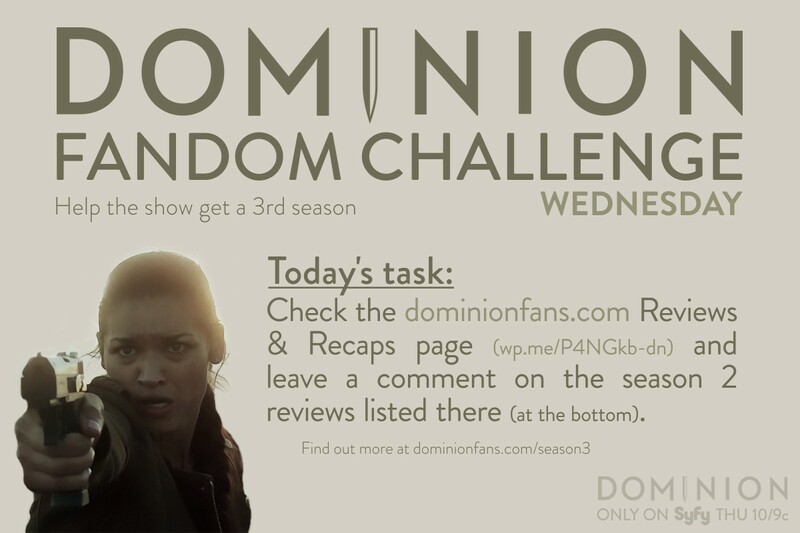 Then come follow our brand spanking new @Dominion_Talk account. We’re posting a new topic of discussion every day. Interaction is greatly encouraged! Last night, Afterbuzz TV live-streamed their one-hour video review of episode 2×03. They had showrunner Vaun Wilmott with them in the studio to add his comments and insights. If you missed it, you can now watch the video on YouTube. As usual, we’ll be live tweeting on Thursday. No special theme this week, just be there with us from 9/8c onwards and join the fun! A lot of the cast and crew will live tweet, please see the banners below for more info. Would be great if you could spread the word. Have you already seen episode 2×03? What did you think? As usual, it’d be wonderful if you could support the show and add your user rating on IMDb and TV.com, and also complete the SpoilerTV poll. The official Syfy website is adding new material almost every day, so it’s always worth a visit. Newly added were the trailer for the upcoming episode 2×04 ‘A Bitter Truth’, the ‘Inside Dominion’ featurette for episode 2×03, and more recap videos from that episode, which you can find in the video section. Dominion: Revelations has chapter III now activated. You can learn everything about the former Mallory leaders if you’re interested to find out more about the mythology behind the show. Want more images? Screencapped.net is uploading high resolution screencaps of the new episodes every week. The Syfy site also has episode photos up from last week’s episode. 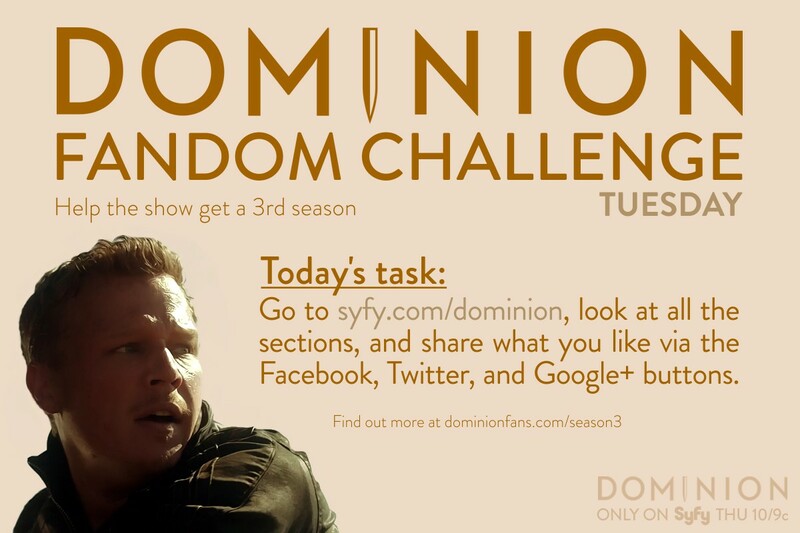 Today, we hope to be seeing you on Twitter for our weekly Dominion season 2 tweetout! Watch live and join us at 9/8c for the Twitter madness! Please also use one of the banners below to spread the word. It would be great if had a nice, big turnout to tweet along with the cast and crew during the episode. 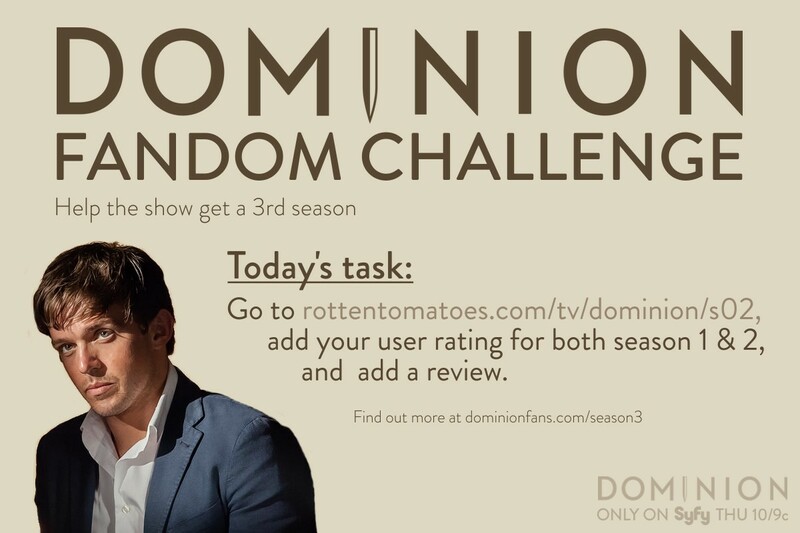 Today we’d like you to comment on all the reviews and recaps that have been written for season 2 of Dominion. Let the world see and read that there’s lots of fans out there who love the show and support it. Most of all: Have fun discovering all the little tidbits about the show you might not have known before! Today we’d like to ask you to head over to the Rotten Tomatoes website to rate and review the show. Let’s get that Tomatometer audience score up! Also, if you’ve missed or skipped one of the previous daily challenges, it’s never too late to go back and complete them now or later. On Thursday (July 23), join our episode 2×03 tweetout. No special theme this week, just plain fun. 🙂 We’ll be back with something to dig your heels into next week. We start gathering on Twitter at 9/8c (2 am UK time, 3 am CET), and we’ll tweet all through the east coast airing, beginning at 10/9c. A lot of the cast and crew will be tweeting along as well. 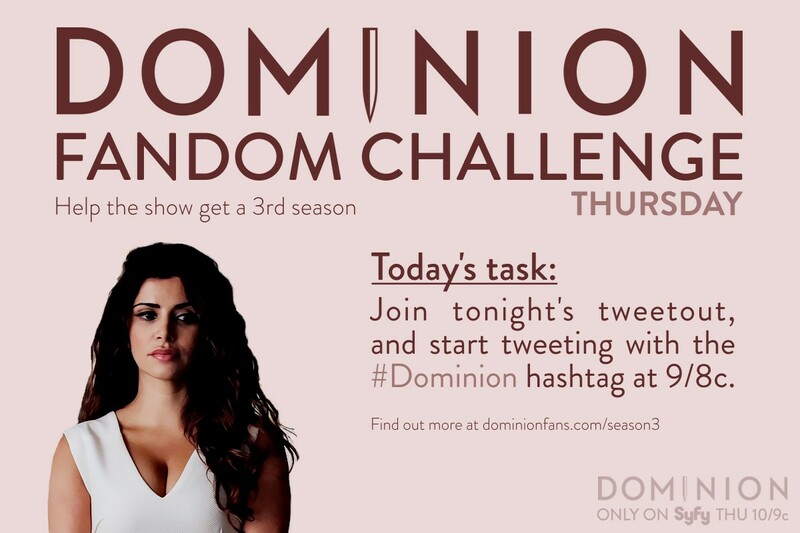 Make sure to use the #Dominion hashtag when you tweet, and copiously retweet tweets that use the hashtag. Spread the word! As a one-off, it would also be great if you could write an amazon review for the show. Because, yes, the network does pay attention to these things!